Age and heavy usage can take their toll on appliance and lamp cords and plugs. Common victims are cords and plugs of appliances you use frequently—irons and blow dryers, for example; ones you’ve had a long time, such as toasters, lamps, and refrigerators; and vintage models whose electrical systems are simply wearing out. • Lamps and fixtures have molded plastic cords. • Heaters typically have neoprene, cotton, or braided rayon cords..
• Power tools have rounded plastic cords. 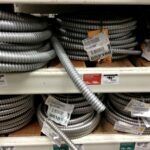 • Vacuum cleaners generally have ribbed plastic cords. If you buy a new cord for an appliance, be sure to get one that is the proper type for that particular kind of appliance. The three basic kinds of plugs are self-connecting, terminal-screw, and three-prong. Lamps and small appliances mostly use self-connecting plugs. The prongs clamp onto the wires of the cord, making an automatic connection. However, these plugs do not meet National Electrical Code standards. With terminal-screw plugs, the wires attach to screws inside the cord body; this type of plug is usually found on older appliances. An older terminal-screw plug often has a removable insulating disk covering the terminals and wires. Newer plugs have rigid insulating barriers. Three-prong plugs are used for larger appliances such as washers, dryers, refrigerators, and power tools and include a prong that grounds the appliance. When planning where you are going to place a large appliance, be sure you have the appropriate kind of outlet available, or plan to install one. This heavy-duty plug is attached with screws. Damaged cords or plugs can be extremely dangerous. They can spark or smoke, causing a fire. If you see a cord or plug sparking, unplug the appliance immediately, and, just to be safe, cut power to the outlet. Let the plug cool for a bit, and then check the plug, cord, and outlet to see if they’re damaged. If the appliance is damaged, take it to a shop to be serviced or buy a new one; if the outlet is damaged, have it repaired or replaced. Disconnect and replace a plug right away if it is cracked or discolored, if it feels warm when the appliance is on, or if it has badly bent contacts. To replace cords and plugs on a 240-volt appliance such as a dryer or other large appliance, purchase a pigtail cord with a plug molded to it. 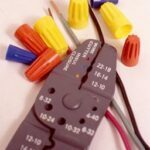 If the pigtail cord or the appliance is not color-coded, first attach the center wire of the pigtail to the center terminal screw on the appliance, and then connect the remaining wires to the other terminal screws. The easiest way to replace a lamp cord is to snip it off, then strip, connect, and tape the replacement cord to it. Push the repaired section inside the fixture. It’s very simple to replace a lamp cord. Simply disconnect the old cord and snip it off, using wire cutters, a few inches below the bottom of the lamp. Tape the new cord to it with electrical tape and then draw the new cord up through the lamp stem by pulling the old cord out from the top. Remove the tape from the cords and discard the old cord. When an appliance cord is defective, it should always be replaced; never attempt to repair it. If you can disassemble the appliance to see how the cord is connected, you may be able to handle this job yourself (be sure to unplug the appliance first). Otherwise, call an appliance repair person. Most cords are secured to the appliance with a strain-relief device, loops, or a clamp that must be removed. For screw-type, solderless connections, unscrew the terminal screws that hold the cord and screw a new cord in its place. Cord wires that are twisted together and secured with wire nuts are easy to undo—just remove the wire nuts, untwist the wires, and reverse the process with a new cord (strip 1/2 inch of insulation from the wire ends). If the cord’s ends are soldered to terminals and you know soldering techniques, you can remove the old cord and solder a replacement to the terminals. Otherwise, leave this work to an appliance repairperson. When you replace a cord, be sure to use an identical replacement; take the defective cord with you to the hardware store or electrical supply company to find a match.